It was clear from the first trailer and all of the marketing tools that were being used that the folks behind "Lockout" were trying to position it as their next surprise hit in the vein of "Taken". This is not going to happen. They found a charismatic leading man not known for doing such commercial films and somehow managed to cast him in the lead. Insert Guy Pearce for Liam Neeson and instead of saving his daughter he will save, hmmm...let's see, I know, how about...the president's daughter! It's genius right? Not really, heck they even have Maggie Grace (the girl playing Neeson's kidnapped daughter in "Taken") to once again play the damsel in distress. Then they throw the concept at you and you become slightly intrigued in the project: space prison. Yea, I can admit I was engaged by the premise of a locking rapists and murderers in a prison not existing on earth. Why couldn't it actually be a possibility? Not a bad idea and apparently producer Luc Besson imagined it had the good grounds for a movie. Unfortunately, the engaging concept is the only good thing the film has going for it besides a few good quips from Pearce's Snow. While Snow is a guy who as you might have heard in the trailer is a "loose cannon" he gives off the vibe as too much of a caricature, someone that could only exist in the movies, and while it is apparent that Pearce knows this and plays it to the hilt what doesn't work is that the movie in itself is so campy this is layering camp on top of more camp. 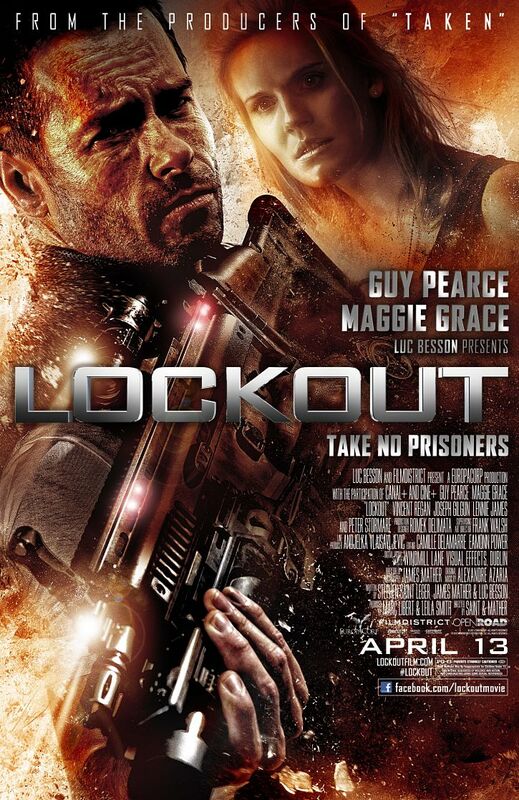 I can understand intentionally making a B-movie, but "Lockout" turns out more of a parody of the genre. daughter Emilie (Maggie Grace) some supplement. If you are one of the lucky ones to not get a bad impression from the trailers for this film and have no idea what it is about, first off: good for you. If by any chance it still sounds like something you might want to check out you should know the remainder of the plot is filled in by making Snow a wrongly convicted federal agent of conspiracy and espionage against the U.S. He has supposedly killed a senior member of the department who was one of his friends, so why would he do that right? This friend left him a package that he gave to his partner to hide as he was captured and taken in for questioning. His friend hides the package but of course gets caught and ends up where? 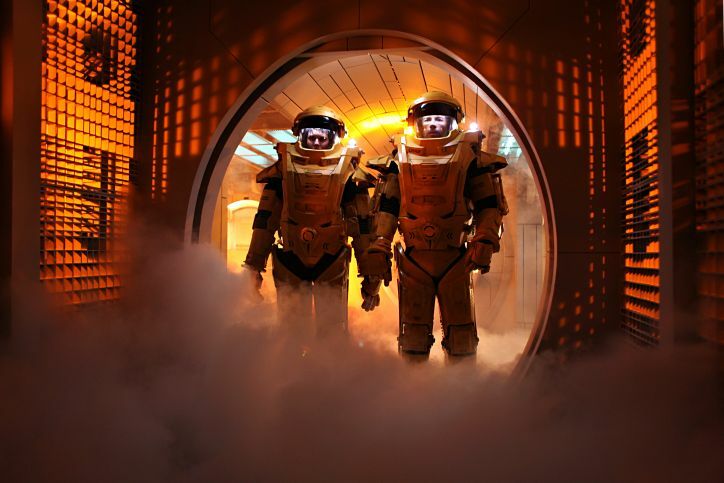 You guessed it, the space station prison. So, Snow is lucky when the opportunity arrives for him to gain his freedom by taking on the mission of rescuing the presidents daughter on that same space station after a massive break out occurs and she is taken hostage. While you will likely be laughing at many things throughout the film, I can at least recognize a few good things and commend first time feature directors James Mather and Stephen St. Leger for bringing a consistent frenetic pace and grungy tone to the experience. While this could also be credited to the editor and set design team, the directors at least seem competent in the story they are telling and move it along nicely as everything falls into place in expert fashion. It is certainly run of the mill, but Pearce elevates the whole thing a few notches by just appearing here and when he slyly spits out his sarcastic quips they will once in a while land just perfectly and make you smile back, knowing everyone involved here realizes the ridiculousness of the whole thing. is the real loose cannon in "Lockout". Now, I am usually one to enjoy a good piece of sci-fi, but I prefer the type where the tone is more self-serious and on a massive scale that allows the audience to also realize the gravitas of the situation. I didn't fully expect this going into "Lockout" but I did at least expect a few major set-ups that would warrant a point of amazement that would stick with me, but in the most elaborate of these on "Lockout" I found myself laughing at the implausibility of it. I also found myself laughing at the fact the year is supposed to be 2079 and Snow (who probably would have been born around 2039) is making remarks about global warming as if that trend would have not been forgotten. There are several things like this that have to be taken into consideration when changing the time frame considerably. I mean, at the very least could we not have something a little cooler than regular ole bullets by that time. C'mon guys, if you're gonna serve the audience play by play action movie cliches then at least get a little inventive with the details. The one aspect of the film that really made it fun for me though were the inmates who are put to sleep while they are imprisoned on this space station and so when they wake up a few of them can seem a bit off. 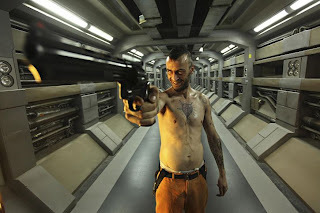 The one who starts this whole riot is a manic, glass-eyed and gold capped druggie that looks like something out of a Guy Ritchie movie and as played by Joseph Gilgun is really the "loose cannon" here as he has no problem killing someone off, and the movie has no regard for human life. His brother happens to be he ringleader of this whole circus and with their thick Irish accents we can see the glee in their expressions as they do whatever they please to manipulate the negotiations. Vincent Regan plays older brother Alex and while you'll probably recognize him from a number of sword and sandal epics he does his best here to ham it up as the "smart convict". Their actions may be shameless but at least they add a little spice to the mix. last ditch effort to survive. While the conclusion wraps everything up neatly for this adventure it is clear that the makers are setting things up for a sequel just in case this makes enough money. You get the feeling we won't be seeing more adventures of Agent Snow though as this doesn't have the charm or the appeal that "Taken" had when it appeared out of nowhere in 2008. What made that film such a surprise, so engaging was the very limited glimpse of what was to come in the marketing campaign. It was genius and whoever had the idea to put the emphasis on Neeson's deep and intimidating Irish voice was right on the money. None of that could be said to save "Lockout". This is more an attempt in a new direction where the high-concept overrides the need for anything else, even logic. There are sparks of fun and glimpses of what might have been a franchise starter, but when it comes down to it this is very basic filmmaking and as much as I appreciate Pearce's effort, he just didn't come off as the John McClane of the future that I expected him to be. Oh well, another shot at something that might have been kind of spectacular had it been done with more ambition and better special effects (some of these are as cheesy as the dialogue) but fails to live up to the promise of an underrated actor in a take off on some kind of 80's-riddled adventure flick flounders and becomes something the studio didn't even want to spend money on in post to convert to 3D. they knew the conversion price wouldn't be warranted by the box office returns so why even bother seeing it? If you still want to, go ahead, but don't say I didn't warn you.